ATTENTION! THE APPLICATION DEADLINE HAS BEEN EXTENDED TO 21 APRIL 2019. CONSULT THE UPDATED SELECTION SCHEDULE TABLE FOR DETAILS. [Updated 16.04.2019] GOOD NEWS FOR APPLICANTS FROM ARMENIA, AZERBAIJAN, GEORGIA AND TURKEY! TRAVEL GRANTS ARE NOW AVAILABLE ALSO FOR CANDIDATES FROM THESE FOUR COUNTRIES COURTESY OF THE BLACK SEA TRUST FOR REGIONAL COOPERATION. The Economic Policy Institute (EPI) looks forward to hosting the 20th anniversary edition of its flagship regional initiative: the traditional Summer Seminar for Young Public Policy Professionals from South Eastern Europe and the Black Sea region. SS2019, entitled “Public Policy Challenges – European and Regional Dimensions”, will be held in the period 3 – 7 June 2019 at Albena resort on the Bulgarian Black Sea coast (close to the city of Varna). After a competitive selection process the regional seminar will bring together a diverse group of 40 outstanding young public policy professionals from state institutions and policy-oriented think-tanks/research centers from South Eastern Europe (SEE) and the Black Sea region. • regional cooperation in SEE & Black Sea area. Beside the key-notes and lectures, the event, which serves also as a platform for exchange of expertise and ideas, will feature intensive discussions in a working-group format and tailor-made interactive modules. SS2019 Program Overview is available here. 3) to have excellent written and spoken command of English (above B2). Eligible Nationalities: Albania, Armenia, Azerbaijan, Bosnia & Herzegovina, Bulgaria, Croatia, Georgia, Moldova, Montenegro, North Macedonia, Romania, Russia, Serbia, Turkey and Ukraine. SS2019 participants will be selected through three independent application processes in an effort to ensure the optimal mix of professionals and favorable group dynamics. If you have participated in previous editions of the Summer Seminar (SS2000 – SS2018 alumni), please contact the EPI team directly to learn about opportunities to get involved and take part in SS2019. The forum was launched back in 2000 in order to contribute to the capacity-building and regional cooperation among young state officials from Bulgaria and Romania working in the field of EU integration. Throughout the years, this regional initiative broadened significantly its scope and geographical coverage (to 15 countries), thus, building a unique professional network of 600+ alumni so far who make it a well-known and highly recognized regional initiative. Browse the SS website for further information about previous editions, speakers, participants and follow-up publications with seminar proceedings. Each year a limited number of full and partial scholarships as well as travel subsidies are available for specific groups of candidates. Detailed information on participation costs, financial assistance and eligibility criteria is provided in the table below. • Candidates planning to apply for full scholarship support are strongly advised to submit their applications as early as possible. 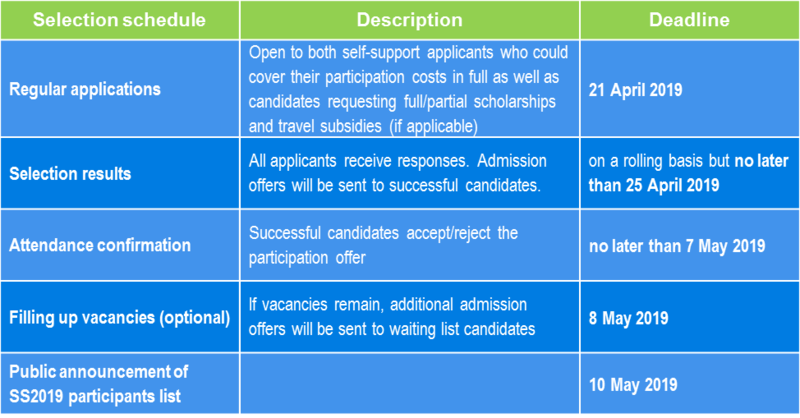 • EPI encourages applicants to seek other alternatives before requesting a travel subsidy (only for eligible candidates). 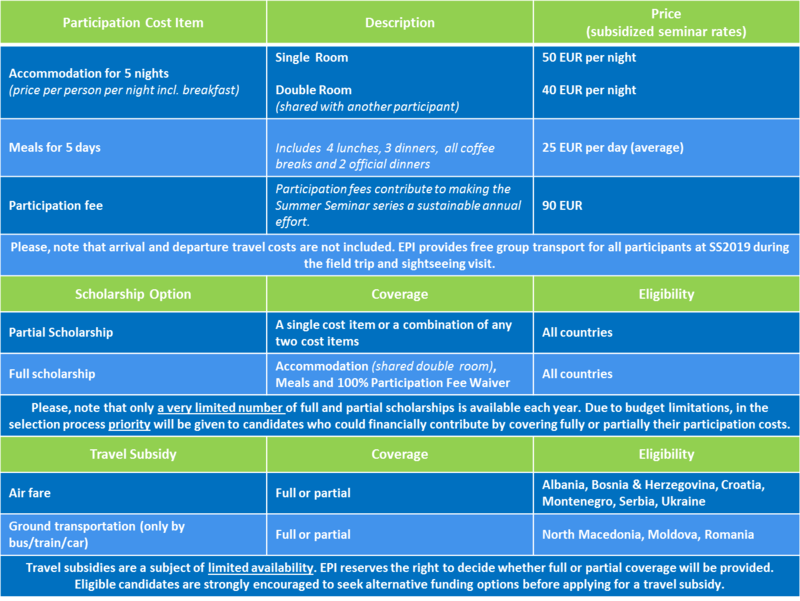 • At present no travel subsidies are available for applicants from Bulgaria and Russia. • Please, kindly take note that Type C candidates (NGO/think-tank, academia representatives) from all 15 countries are exempt from paying the participation fee. They could still apply for scholarships covering accommodation and/or meals as well as travel subsidies (for eligible nationalities).